Our Pepper is certified. Our Pepper contains custom fertilizer organic formula of 20% NPK, Mg + TE. Our Pepper is preferred for reasons of taste, health and the environment without pesticide and fungus killer also known as Fungusize. Our steps to this business have been completely different. All the people are going for medicinal plantation, without knowing what they will do with this product. BUT we have taken the innovative steps. FIRST FINDING MARKET and then think of farming and production. Our team, have achieved so much on the product, which none of West Malaysia companies have done. Our main objective was "market, marketing, on-line selling".One principle, which we have made compulsory for us, is also helping us, "We will only export our products come what may happen". 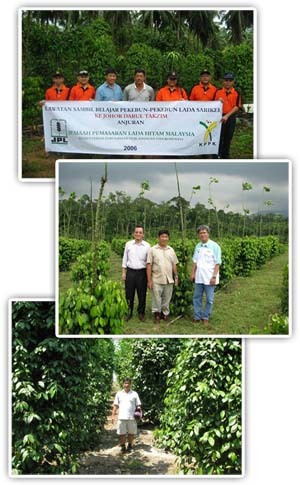 - We (Organic in Pepper) do marketing for number of Organic Certified farmer groups in Malaysia. Our business efforts have resulted into number of new foreign clients on organic products. - Application of organic products in modern life through scientific research and validation. Make our Organic Pepper products available at all corners of the world. - Customer Friendly: We always work towards meeting the specific needs of every customer. - Versatile: We can supply Formulations in raw form, as powder, extract, alkaloid and Formulations in bulk quantities. - Quick response: Customer query reply in 24 hours time. We keep the customer completely updated about the progress of the delivery schedule through our mailing systems.